Paris is world-famous for its art museums, most notably the Louvre. Lewis & I visited tons of museums during our trip to Paris, including the big three art museums the Louvre, the Musee D'Orsay, and the Musee de L'Orangerie. At the Louvre is one of the most famous pieces of Greco-Roman sculpture, the Venus de Milo. 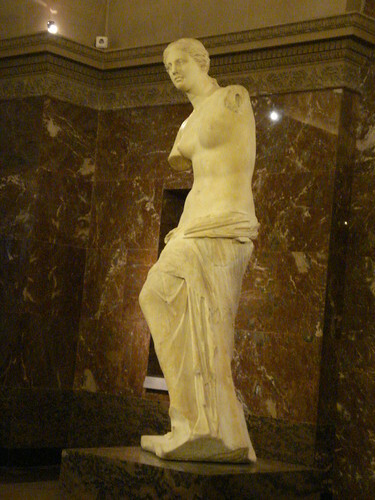 This statue of Venus (Aphrodite) is so famous as to be cliche, but did you know she might have been spinning? Spinning the thread of life? Spinning does have its place in Greek & Roman mythology, after all - for instance, the three moirae or three fates, who spin, measure, and cut each person's life. Spinning was tremendously important of course, so it's no wonder it shows up in myths - before machine in mills spun thread, even before foot-powered wheels, you couldn't make clothes without yarn to weave (or knit). The theory is expounded upon in Venus de Milo, the Spinner by Elmer Suhr, which is on my potential reading list for sure. Sadly, I'm not inclined to believe that theory (at least until I read more about it), because in the very same hall at the Louvre there are half a dozen similar Aphrodite statues, with their arms in the same orientation as Venus de Milo, holding apples - but still, it's fun to imagine that this world-famous statue might be of a spinner. The Musee D'Orsay has a fantastic collection, specializing in impressionist and post-impressionist works. Unfortunately the Orsay doesn't allow photography, but luckily it seems they have their whole collection on their website! Two pieces at the Musee D'Orsay particularly interested me from a fiber perspective. First, there was The Spinner, by Jean-Francois Millet. It depicts a young woman with goats, carrying a distaff and spindle. It seems that while you find spinning wheels everywhere, depictions of drop spindles are rare and everyday people don't know about them - so, I was very excited to see a painting of a spindler in the museum! Second was this painting, Vision by Alphonse Osbert. This painting really appealed to me. The Museum d'Orsay's website tells me it depicts St. Genevieve, who is the patron saint of Paris. Genevieve was only 15 when she decided to become a nun, and this is a painting of her epiphany. I'm not a religious person but there's something very calming and tranquil about this painting, the young girl out with her flock, a sheep nuzzling at her side.